This year I’ve been contemplating my approach to reading as a means of getting better as a writer. There are a few novelists who have risen to the top in my personal opinion poll, and I’m thinking about setting goals around reading everything that they’ve written. If he wasn’t so prolific, John Irving would be one of them, and A Prayer for Owen Meany is a prime example of his quality as a writer. A Prayer for Owen Meany has been around for a while. It is the story of John Wheelwright and his friend, Owen Meany, who believes he is an instrument of God. The story is told alternating between present day and non sequential narratives of their childhood growing up. For those who may have seen the movie Simon Birch, that is based on the first part of this book. 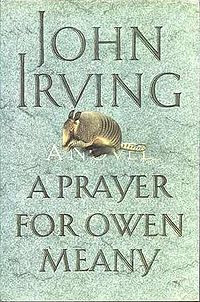 Owen lives life focused on his death – an event he has had visions of and actually writes about in a journal that the narrator, John, reads after Owen dies. This permeates a theme of fate versus free will throughout, which is furthered by other religious topics of Christ-figures and virgin births. While this may sound heavy – and at times it is – John Irving is funny. Laugh out loud funny. In a story where a stuffed armadillo and a human size mannequin play significant parts in their symbolism, how could a reader not smile? But, there is also much that is sweet and tender in these two boys as they strive to grow up, learn where they came from and where they are going, and what they mean to one another. Great review. I've heard so many good things about this book but have yet to read it. Thanks for your great review 🙂 I am bound & determined to read this because I absolutely loved The World According to Garp. This should make for a great follow-up! Dar – this would be a great place to start with Irving. T/L – I loved Garp, too. And I really enjoyed Cider House Rules and Until I find you. I have Last Night on a Twisted River on my Christmas wish list. For fans of Irving, wikipedia has an interesting chart of his books & common themes… I think it is sort of funny, actually. I read this book some time ago and sadly do not remember as much as I would like. But I will never, ever forget sweet Owen. The end is unforgettable. I get shivers still when I think about it at least 14 years after having read the book. I've always been interested in A Widow for One Year. Too many books, so little time…. This book is one of my favorites. I’m a 45-year-old stay-at-home mom that’s going back to school. I’m interested in everything especially the sciences and health care. Every time I get the odd feeling that I’m preparing for something big, but I don’t quite know what that big thing is, I think of Owen Meany…which is a lot.